By reader request, here's a look at transits for this coming April 15, when Black Lives Matter has protest events planned. These events in the past have nearly always devolved into property destruction and violence. Billionaire financier George Soros, seen by insiders as the puppeteer of the US Democratic Party, has been a major funder of Black Lives Matter. 1. Is Pallas weakened by "Dionysian" aspects? Yes, but they're very weak: Pallas is decile the South Node, and Pallas ruler Mars is widely trine Pluto. These are quite weak, and somewhat mitigated by the semisquare from Mercury to Pallas. 2. 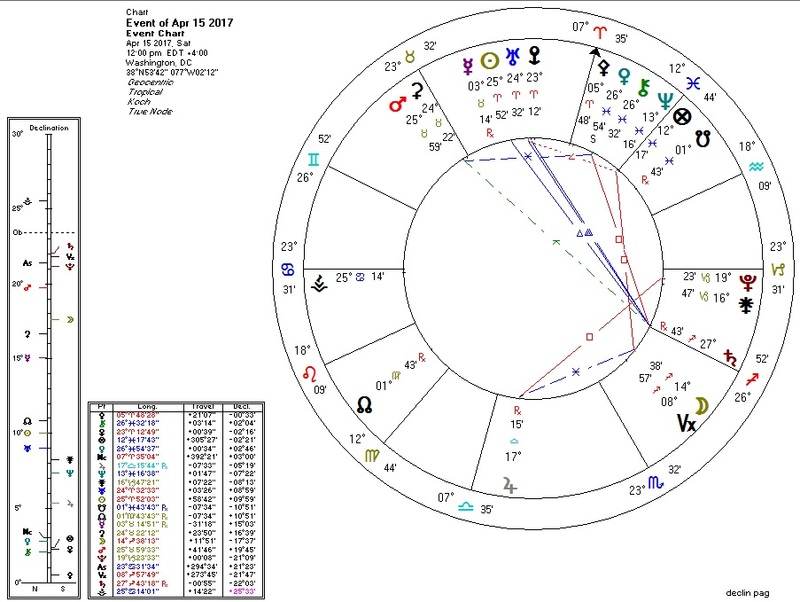 Is Venus liquefied by Neptune and/or the South Node? Yes. Venus is is Pisces, ruled by Neptune which is also very widely conjunct Venus. 3. Is there a Venus-Pluto contact? Yes, weakly. Venus co-ruler Jupiter is square Pluto. 4. Is there a Moon-Pluto contact? Yes. There will be a sextile that evening. 5. Is there a Sun-Pluto contact? Yes, but very weak. The Sun is ruled by Mars which is widely trine Pluto. I am not completely ruling out a fatality or two, but I think chances are good that the day will pass without murder related to the protests. Mars conjunct Ceres and Algol, quincunx Saturn: destructive action against structure, possibly involving theft or things going missing? Then again, the Pallas aspects are not terribly destructive. My guess is that we'll see some misbehavior, but perhaps not on the "front page news" level. So I hope. Jupiter square Pluto: associated generally with social movements/protests and very specifically with such events when they are funded by George Soros, who has these two planets conjunct in his horoscope.